← How would you like your eggs? 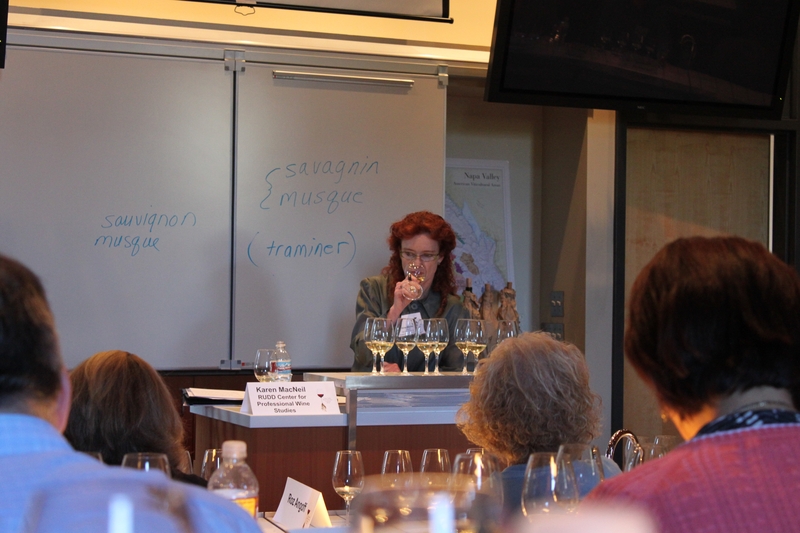 Karen nosing a Sauvignon Blanc at the Rudd Center for Professional Wine Studies at the CIA in Napa. I was excited that Karen was part of my Napa Valley adventure, as her book, The Wine Bible , was the first wine book I ever read. We also use it here at The FCI in some of our wine classes. She led us through a tasting our first day and administered our quiz on the last day. At one point she asked the question, “What makes great wine great?” Her answer was “distinctiveness”, quickly adding that that doesn’t always translate to likability. She noted that when a wine is really good, as a teacher, it makes you a little nervous because there’s not much to say. She elaborated on the idea and mentioned that when she finds she has few words it’s either because she’s not paying attention, the wine doesn’t have a lot to say, or the wine is so beautiful. She did just fine finding words for our class and it was fun to see the personality I recognized from her book standing at the front of our classroom.